And the winner is… Option A! Option A won with a score of 62. The company polled 50 respondents, and the preference for Option A was consistent for all ages and genders. Most poll respondents who preferred Option A observed that the product looked far more appetizing than the iced tea in Option B. One respondent, when discussing the photo in Option B, stated, “The liquid mush makes me uncomfortable/woozy.” Another individual said, “The picture of the tea powder looks fresh and… healthier… B looks like a cup of slime.” Several other individuals used the word gross to describe the drink in Option B. When discussing Option A, many stated that the bright color of the product made it look more appealing and healthier. It’s a recurring observation we make here at PickFu, and an important one to keep in mind when creating your product photos: show the customers what they will get. 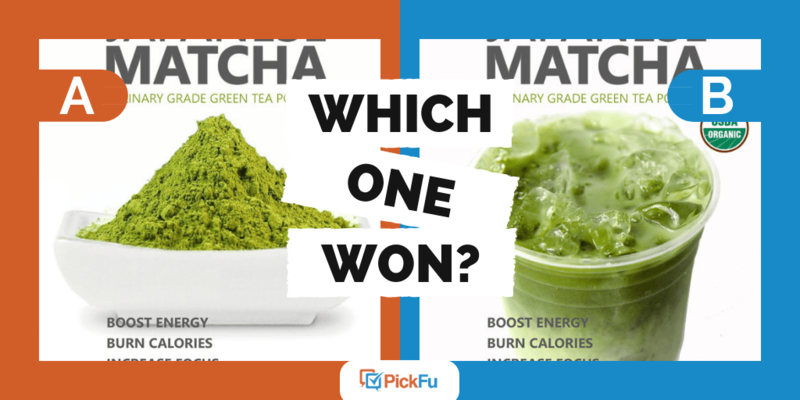 PickFu poll respondents often state that one of the most important components of a product photo is showing them exactly what they are getting when they buy the product. Respondents to this poll observed that showing the powder in its pre-mixed state gave them a clear understanding of what they will receive when they purchase the product. One individual even said he/she felt deceived looking at the product in Option B since he/she isn’t actually getting a liquid drink. Several respondents also preferred Option A because it didn’t restrict the product to being only used for tea. One test panelist made an interesting observation, stating, “since there are multiple uses for the product, limiting [it] to one drink may not do the product justice.” Other respondents felt the same, noting that the powder created more possibility for how they could use it. When creating your own e-commerce photo for a health product, keep in mind how appetizing the photo may be. You also want to make sure that the photo is not misleading—customers should know from looking at the image exactly what they will get when purchasing the product. Lastly, try to avoid limiting your product’s uses. Showing the image of the product in its natural state (and as users would receive it) allows them to consider how they will use it. For more tips on creating fantastic product photos, we recommend reading more about optimizing product photography. You can also test your e-commerce photos by creating your own PickFu poll and get results in minutes.